Racers Learn Self-Promotion and Sponsorship Seeking Tips Morgantown, W. Va. (August 30, 2012) – Ricky Carmichael University presents a unique opportunity for both competitors and crewmembers to learn all aspects of being a well-rounded racer on and off the track. MX Sports is pleased to announce the addition of Hookit, an online and mobile sports networking tool, to the RCU Lake Elsinore informational seminar lineup. 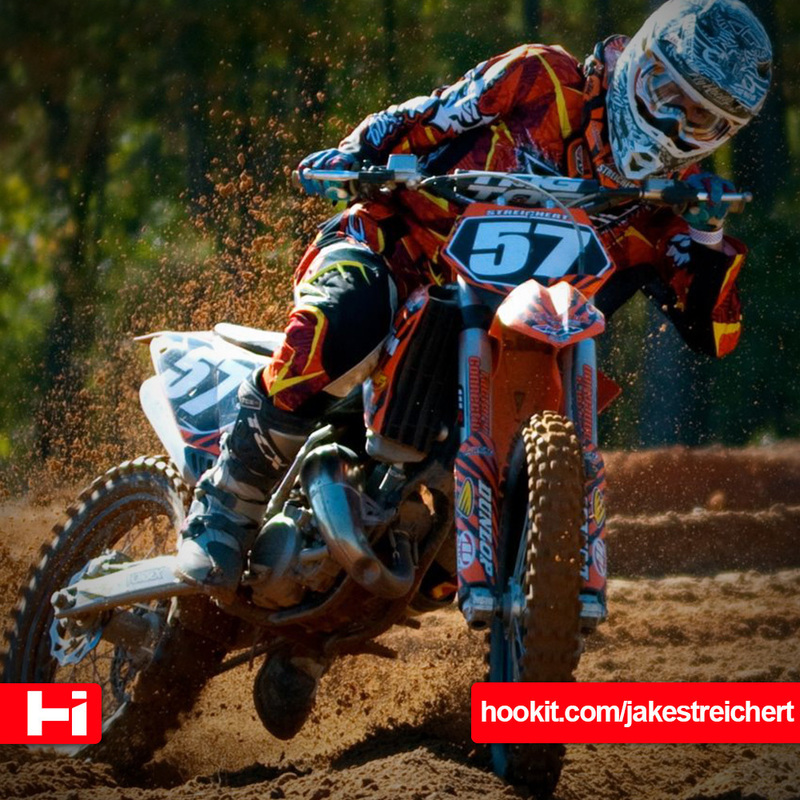 Hookit will have a representative on site to speak to family members, mechanics and students about the importance of self-promotion and seeking sponsorship in the motocross industry. “RC’s history and success in racing speaks for itself. His knowledge is invaluable for riders and we’re honored to be a part of such an amazing program,” said Scott Tilton, CEO Hookit. “Our session on sponsorship and self-promotion is just one component required for a successful career in motocross and we’re excited to have the opportunity to share that with the riders.” Hookit is one of many industry supporters to head an informational seminar at this year’s RCU at Lake Elsinore. Parents, family members and mechanics are invited to attend various seminars throughout the day while students are receiving instruction on the racetrack. “We’ve always had off-track instruction incorporated into the RCU lesson plan but this year at Lake Elsinore our supporters have really went above and beyond to give the whole family valuable information,” said Ricky Carmichael. “We really encourage you guys to take advantage of this because it’s a rare opportunity to spend a day with industry professionals who are there just for you.” RCU is an exclusive and unprecedented opportunity for motocross riders on the west coast to learn from The-Greatest-of-All-Time and his accomplished faculty. For more information and to register for the event, go to http://www.mxsports.com/pages/rcu/rcu-lake-elsinore . About Ricky Carmichael University Ricky Carmichael University began in 2010 as a once in a lifetime opportunity for riders of all ages and skill levels to learn from The-Greatest-of-All-Time, Ricky Carmichael, in conjunction with the Ricky Carmichael Amateur Supercross at Daytona International Speedway. Due to the expansion of racing in 2012, Daytona was no longer able to facilitate RCU, thus expanding this exclusive riding school to Lake Elsinore in California and for the first time ever, Fat Cat Moto Parc in Doncaster, UK. For more information, please visit www.mxsports.com . About Ricky Carmichael Ricky Carmichael won 102 American Motorcycle Association (AMA) Motocross Nationals and 48 AMA Supercross main events for a record 150 major wins between 1997 and 2007. The Tallahassee, Fla., resident won 10 AMA Motocross Championships and five AMA Supercross crowns, giving him a record 15 major titles in his career. After retiring from professional motocross racing, he began pursuing a career in auto racing and was named the 2009 NASCAR Camping World Truck Series Most Popular Driver. Currently, Carmichael can be found in the TV booth providing color commentary on CBS and Speed’s Supercross coverage. As for motocross, he will forever be known as “the Goat,” which stands for greatest of all-time.